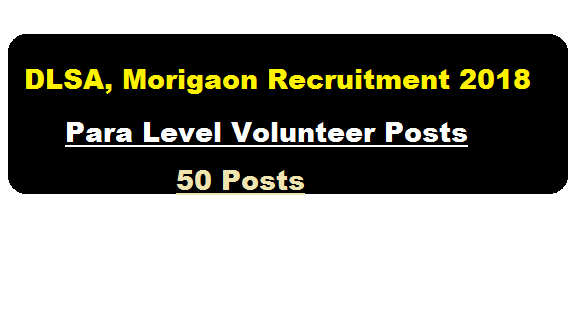 District Legal Services Authority,DLSA Morigaon Recruitment 2018 | Para Level Volunteer (PLV) [50 Posts] : Hello everyone ! We are back with a NEW JOB News in Assam. The District Legal Services Authority Morigaon has published a recruitment notification 2018 in the month of July and we will discuss in details about this DLSA recruitment. According to the latest DLSA Morigaon Recruiitment 2018 July, Applications are Invited from the residence of Morigaon District alongwith two numbers of passport size photograph and self addressed stamped envelope forselection of 50 numbers of PLVs. who are desirous/willing to serve as PLV (Para Level Volunteer) at different corners of Morigaon District under the baton of District Legal Services Authority, Morigaon. In this section, we will discuss in detail about Recruitment of para Level volunteer posts under District Legal Services Authority Morigaon Assam Recruitment 2018 with all the details and requirement. Educational Qualification: The applicants should have the minimum qualification of Matriculation (10th Pass) and they should have the mindset to work for the marginal section of the society. Age Limit : The minimum age of the selection of Para Legal Volunteer should not be less than 21 years as on the date of 01.01.2018. Preferably the PLVs shall be seletted, who do not work up to the income they desire frorn their service as PLVs but they should have a mind-set to assist the needy In the society. Pay: The work of PLVs does not carry any salary, remuneration or wage except remuneration fixed by District Legal Services Authority, Morigaon from time to time. as per Rules. (a) Teachers (including retired Teachers). (b) Retired Government Servants and Senior Citizens. (c) M.S.W. Students and Teachers. (f) Students & Law Students (till they enroll as Lawyers). (g) Members of Non-Political Service Oriented NGOs and Clubs. (h) Members of Women Neighbourhood Groups Maithri Sanghrams and other Self-Help groups Including marginalized and vulnerable groups. (i) Educated prisoners with good behavior serving long term sentences In prisons. (j) Any other person whom the District Legal Services Authority deems fit to be identified as PLVs. The filled up application should reach the Office of the Secretary, District Legal Services Authority, Morigaon on or before 18.08.2018. The applicant should submit their Mobile/ contact number in their application for further required communication, if any. Incomplete application will be summarily rejected without assigning any reason thereof. No application will be entertained after the last date fixed. The decision of the Chairman, DLSA Morigaon In shortlisting the no of candidate for interview and selection of PLVs shall be final.